Blepharoplasty is the medical term for cosmetic eyelid surgery. It is performed to freshen up the eyes and restore a younger, healthier appearance. There are two types of blepharoplasty. Upper lid blepharoplasty is performed to rejuvenate the upper eyelid, while lower lid blepharoplasty is performed to rejuvenate the lower eyelid. The scars from blepharoplasty are very well concealed. The upper eyelid incisions are hidden within the upper lid crease. 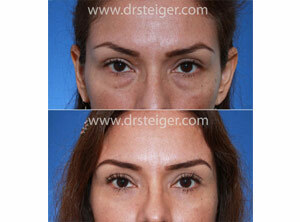 Dr. Steiger performs most lower lid blepharoplasty from the inside of the eyelid, without any skin incisions. This is called a transconjunctival blepharoplasty approach. In some instances, an incision is placed just below the lash line. This incision is not noticeable once healing is complete. This is called the transcutaenous approach. Traditionally, blepharoplasty (eyelid lift) is performed by removing excess skin, muscle and fat from the eyelids. Unfortunately, this can often be overdone and give the eyes a “hollowed-out” appearance. 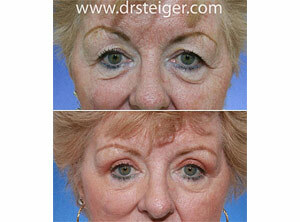 Eyelid fullness is an important attribute of a youthful and attractive appearance. A hollow appearance is rarely a sign of a youthful eyelid. This is evident when looking at earlier photographs of yourself or fashion models in their 20’s. 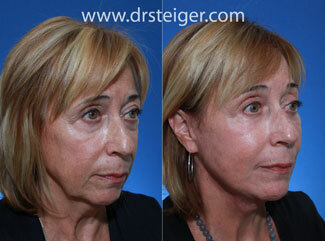 Dr. Steiger utilizes the most advanced blepharoplasty techniques in order to rejuvenate the eyelids. Facial fat is a valuable commodity and should not be removed unless absolutely necessary. Instead of removing eyelid fat, Dr. Steiger releases and repositions the fat from within the eyelid to recreate a smooth transition between the eye and cheek. This technique can achieve a more natural and youthful appearance. Will my eyelids look hollow? Eyelid fullness is a sign of youth and beauty. However, surgeons are traditionally taught to remove fat from the lower eyelid when performing blepharoplasty. This can lead to a hollow eyelid after blepharoplasty. 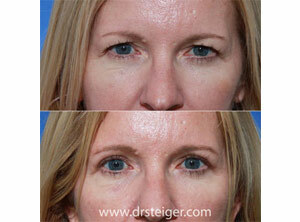 Dr. Steiger avoids the hollow look by performing advanced blepharoplasty techniques that rejuvenate a youthful appearance without removing fat from the lower eyelid. Rather then removing the excess fats, he repositions it to a more youthful location. This prevents a hollow appearance and looks the most natural. Will blepharoplasty fix the dark circles under my eyes? This depends on the cause of the dark circles. If the dark circles are caused by a shadow effect from the protrusion of your eyelid fat, then this will improve. However, in some cases the dark circles are caused by pigment within the skin. In these cases adjunctive procedures may be necessary for improvement. 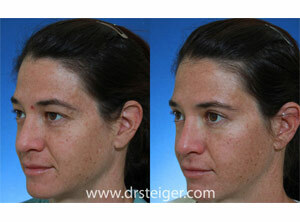 Dr. Steiger will evaluate this during your consultation. Will blepharoplasty improve my vision? Upper eyelid skin can be so redundant that it blocks your field of view. This is called blepharoptosis. If this is present, upper eyelid blepharoplasty will improve your ability to see. Do men have this procedure done? Absolutely. Aging affects both men and women. This is especially true when it comes to the eyes. In today’s workplace and social environment, men are increasingly undergoing cosmetic procedures to improve their appearance. Depending on your line of work, most patients can return to non-strenuous acitivity within a few days after the procedure. Bruising may be noticeable, but can be covered using camouflaging make-up. The results of cosmetic eyelid surgery are long-lasting. In the majority of patients this procedure is only performed once. I would like to avoid the operated look, is this possible? Yes. 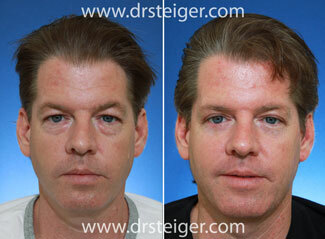 Many patients seek out Dr. Steiger for this reason. His treatment philosophy is based on creating a natural look. His practice is dedicated to only the face, and he offers the most advanced, up-to-date blepharoplasty techniques to achieve these results. I have has prior eyelid surgery and the areas around my eyes are now more hollow, can this be fixed? Repair of overly hollow eyelids can be difficult, but is possible. During your consultation Dr. Steiger will analyze your face in order to determine how he can restore a more natural look. Advanced fat grafting to the periotbital region may likely be the required.